Students, we need you to help us reach our goal of 1,000 UKnighted on March 30! A gift of $5 or more qualifies you for a pair of Wartburg socks. 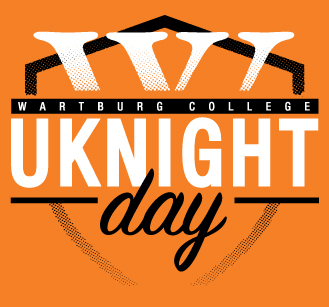 Make your gift online at www.wartburg.edu/uknightday and stop by headquarters in the student center (outside the Wartburg Store) from 9 a.m. to 7 p.m. Thursday. Will your class be the finest in the east or west? The Wartburg Players will present The Rabbit Hole, a 2007 Pulitzer Prize-winning play by David Lindsay-Abaire, on Friday, March 31, and Saturday, April 1, at 7:30 p.m., in McCaskey Lyceum. This funny, tragic, and deeply moving story follows a young couple and their family as they attempt to cope with the loss of their young son. (Some scenes may not be appropriate for children.) This production is student-directed and student-run. Tickets can be purchased at the door or by visiting the Ticket Office in the student center: $10 for adults, $5 for students (K-12 and non-Wartburg College), and free with a Wartburg student ID. Monday, April 3 – What’s Public Health? Public health focuses on disease prevention and health promotion by helping others to improve their health through education and awareness. Each day you may find yourself identifying with some of the common challenges for college students and learning how you can prevent them. Stay tuned for more details on specific events. Contact Dr. Lorinda Sheeler with questions. Student Senate is looking to fill its 2017-18 executive team. Applications can be found here and are due Thursday, March 30, by 11:59 p.m. Direct questions to senate@wartburg.edu. The Wartburg Philosophical and Literary Society will meet Friday, March 31, at 4 p.m., in McCoy West. The first speaker will be Noah Dwyer, a fourth-year religion major. The title of his talk is A New Interpretation of the Beatitudes. The second speaker will be Sarah Leonhart, a fourth-year psychology major. The title of her talk is Gender Perceptions of Males and Females in Positions of Power. Target Distribution in Cedar Falls will be on campus to share information about its internship program and positions for graduates and will host a free pizza lunch Tuesday, March 28, from 11:30 a.m. to 12:30 p.m., in the Chapel Commons. If you would like to attend, RSVP to jo.dorrance@wartburg.edu no later than Monday, March 27. The next Math, Computer Science & Physics Department Seminar will be Tuesday, March 28, at 11:30 a.m., in SC 134. Alex Jensen ’15, a graduate student in mechanical engineering at Iowa State University, will discuss his current research in a talk titled The Evolution of Hardness and Tribofilm Growth During Running-In of Case Carburized Steel Under Boundary Lubrication. All are welcome. Refreshments will be provided. BSU will host its fifth annual Hoops 4 Hope basketball game, where faculty/staff/alumni play against current students, at 4 p.m. Saturday, April 4, in Levick Arena. All proceeds will go to IMPACT, a youth basketball league out of Waterloo. Donations of $5 from all players are appreciated. For more information, please contact bsu@wartburg.edu. Designated study rooms will be reserved on the third floor of Vogel Library for social work mock interviews Friday, March 31, from 10 a.m. to noon. All other rooms will be open for student use, as well as Counseling Services and Pathways. 1st-Art-Gallery.com is offering a $1,000 annual scholarship, which is designed to help a student become successful in a career focused on one aspect of art or design. Applicants must submit their entry along with a piece of art of which they are most proud. The winner will be selected by the end of June. The deadline to apply is May 31. Click here for more details or to apply. Students, faculty, and staff are invited to a showing of Warhorse on Tuesday, March 28, at 7 p.m., in Patriots Hall, 1300 Fourth St. NW, Waverly. Sergeant York will be shown in the same location Tuesday, April 4.The film series commemorates the 100th anniversary of the end of World War I. Wartburg College humanities and social work faculty members are partnering with the new Waverly-area veterans post. All area veterans and their families also are invited to view the films and discuss their reactions. Access to these films is made possible by funding from the Harry & Polly Slife Professor in Humanities, historian Dr. Terrence Lindell, and the Slife Institute for Social Work. During our Wednesday Lenten chapel time, the worshipping community will focus on wholeheartedness and what it might look like for us to live in God’s promise of wholeness in Christ Jesus. Join us at 10:15 a.m. on Wednesday, March 29, for a Lenten Interfaith Chapel Service by Dr. Kuni Terasawa, focusing on the Lenten topic “compassion.” College administrative offices will be closed during chapel time, 10:15-10:35 a.m., Wednesdays during Lent to allow staff and faculty the opportunity to attend chapel. The W, Security Office, and Information Desk will remain open. Pastor Brian Beckstrom will give the message Sunday, April 2, 10:30 a.m. in Wartburg Chapel. Join us! Looking to jump-start your faith life? Spiritual Life & Campus Ministry is offering a discipleship process called The Jesus Experiment to help you answer the question, “How would Jesus live my life if he were living it?” Join us Wednesday, March 29, at 7 p.m., in the Chapel Commons. Everyone is welcome. Click here to find out more. The Volunteer Action Center is hiring for an office coordinator (whole year), student organization liaison, and a community organization liaison (Fall Term with possibility of Winter Term as well). Applications are due by 4 p.m. Thursday, March 30. Interviews will be the following week. For an application, click here. Direct questions to vac@wartburg.edu.